Typically, food plot locations are picked based on existing openings on a property. While it is certainly worthwhile to consider using these openings, there are many times when they may not be in ideal locations to hunt. Additionally, some properties do not have existing openings to plant. When this is the case, it may be advantageous to consider food plot creation through additional openings. Before a new opening is created, it is critical to think about how the plot will be accessed and hunted. Making a new food plot is an investment, and it would be a shame to create a plot that could not be hunted due to swirling winds or bad access. I would also recommend going ahead and picking out some trees to place stands in, as the shape of the plot may need to be influenced by the arrangement of good stand trees. 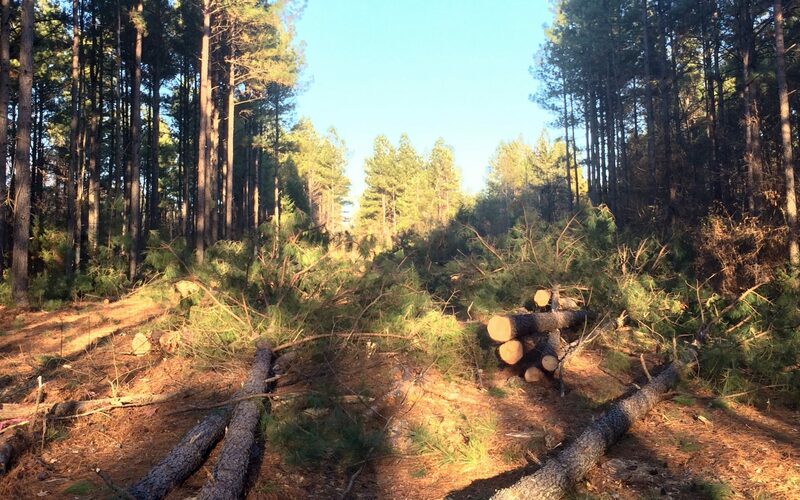 The first step to clearing this plot was harvesting the timber, which helped generate revenue to complete the process. The method used to clear the plot will depend largely on what is present on the site currently. If there are trees that are valuable for timber, it is certainly advisable to go ahead and have them harvested. This can often be done in conjunction with other timber harvest taking place on the property. We created a new plot this past year, and we did so while the pine stands on the property were being thinned. In fact, we actually created two food plots at this time, as the logging deck was also cleared of trees. Selling the timber off of the site is a win-win, as it clears the plot of trees and generates revenue that can be used to get the land ready to plant. However, if the trees on the site are not valuable enough to warrant a harvest, the same basic steps will be followed. Regardless of whether the timber was cut or not, the land will have to be cleared of stumps and brush before it is planted. This can be done with an excavator, front-end loader, or bulldozer. In our situation, we chose to use an excavator since the stumps were relatively large and spread out. The excavator also provides the benefit of minimizing the amount of soil being moved, but a careful operator can also do a good job with a bulldozer or front end loader. Whatever machine is used, a good operator is critical, as the piles of stumps and slash should be as free of dirt as possible. After the debris is piled, it should be allowed to dry for a few months and burned. Burning will put nutrients from the stumps back into the plot, and reduces the chances of creating a predator hangout right at the edge of the plot. These piles can burn hot, so be aware of conditions and always have plenty of help on hand. 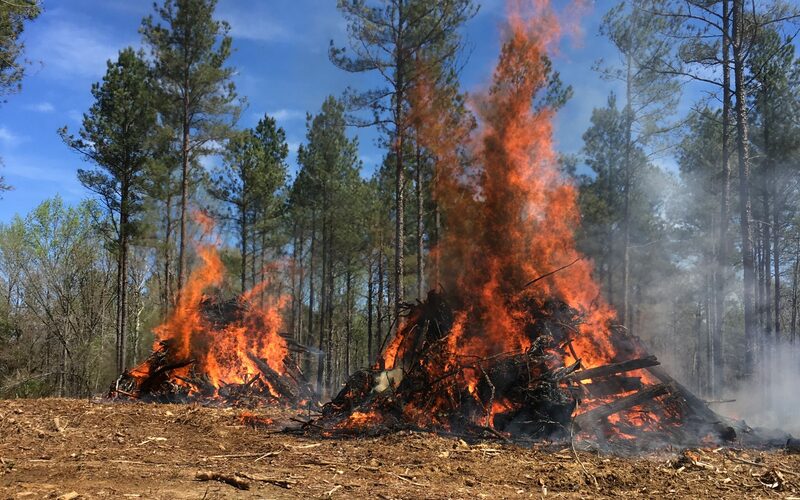 It is likely some of the piles will need to be re-piled and burned again in the future, but most of the debris should be clear of the plot after the first burn. (Above) Be sure to have good firebreaks around the slash piles, as burning these piles can generate a lot of heat. As with any food plot, soil testing is necessary before planting. Our new plots required over a ton of lime to the acre, as well as a heavy fertilization with phosphorus and potassium. Ideally, the soil should be tested and lime applied well in advance of the first planting, but it is most important that it simply gets done. Following testing and amending the soil, it is necessary to consider what to plant. While one could certainly wait for the lime to work ahead of planting, I would rather grow something in the plot during this time. Selecting plants that are tolerant of poor fertility is critical. In our case, the first crop we planted was browntop millet. While it did not provide any deer forage, it worked to prevent any erosion in the plot, and gave us a dove hunting opportunity. Following the millet maturing, we planted a mixture of crimson clover and cereal rye. Despite the low pH of the plot, we still managed to have a successful planting and harvested two deer off of the new plot. Both the millet and the rye are also good biomass crops, which can be useful when building organic matter levels in a new plot. We expect to have even better plantings in the future, but having something growing on the site to attract deer during the first hunting season was an added bonus. Whether your property currently has openings or not, creating new food plots has the potential to greatly increase hunting success on a property. I would encourage anyone with the ability to consider the creation of new food plot locations, as new plots can be tailor-made to allow for hunting success. If you are interested in creating small food plots without the use of timber harvest or heavy equipment, read part 2 here.